This post follows on from Form E: Section 2 parts 1 to 4 (property, bank accounts and investments) and takes you step by step through completing Section 2 parts 5 to 8 of Form E.
Complete this section if you have any life insurance or endowment policies – even if they are not capable of being sold. Fill in section 2.5 for each policy you have, and number the additional ones as ‘7.1’, ‘7.2’ etc. 5. Surrender value – this is the value you will get if the policy is surrendered to the insurance company now. You can get this over the phone. Note that not all policies will have a surrender value – endowment ones will, basic life insurance ones won’t. If in doubt, call up the insurance company to check. 7. 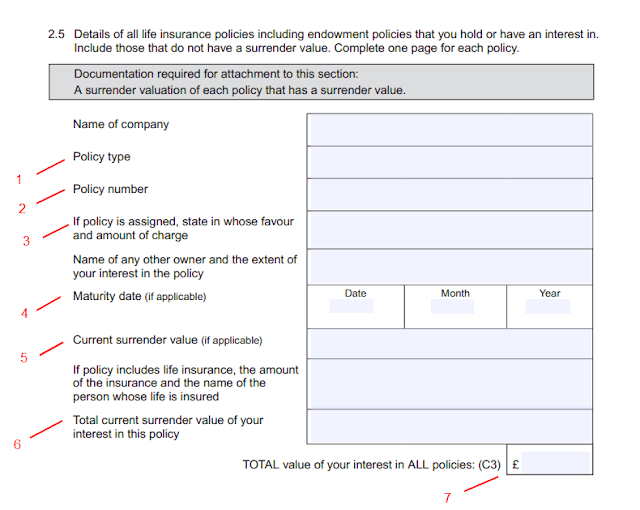 Total value of your interest in all policies – the total of box 6. for each policy; write this total in on the first insurance policy page and leave blank on any others (i.e. 7.1, 7.2 as mentioned above). Fill in this section if people owe you money - for example you lent your brother some money and it is due back to you at some point. Note this section is intended for money owed to you in a personal not a business capacity – money owed to you in director’s loans or partnership accounts should be entered later in section 2.11. 3. 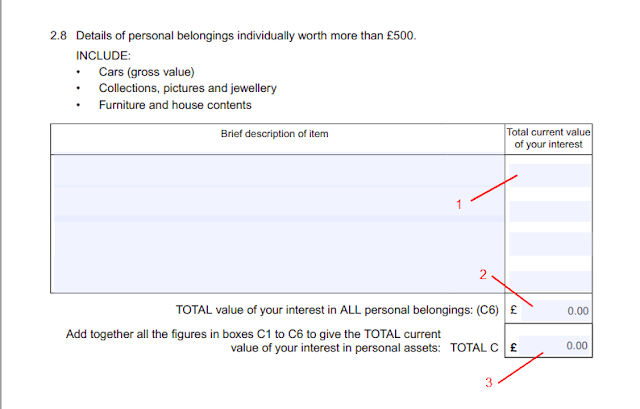 Total value of your interest in all debts owed to you – the total of the amounts entered in box 2. Complete this section if you have any cash sums over £500. It doesn’t mean money in the bank, but money you keep in the safe or under the mattress! 3. Total value of your interest in all cash sums – the total of the amounts entered in 2. This is where you need to list all personal belongings worth over £500. Please remember it is only items currently worth more than £500 that should be entered here. It’s not what you paid for something but what you could sell it for. Important: even if you don’t have any such personal belongings you’ll still need to fill in the bottom box, Total C, here – please see note 3 underneath the image below. 3. Total C – you’ll need to go back over the earlier sections of Form E here, and add up the totals you’ve put in boxes C1 to C6 inclusive, that is from section 2.3 to 2.8 here inclusive. Leave this total blank until you’re sure you’ve entered all the information in the previous sections correctly. My next post here takes you onwards through Form E from Section 2.9 (liabilities and CGT) to Section 2.14 (other assets).